Bad handshakes leave bad first impressions. 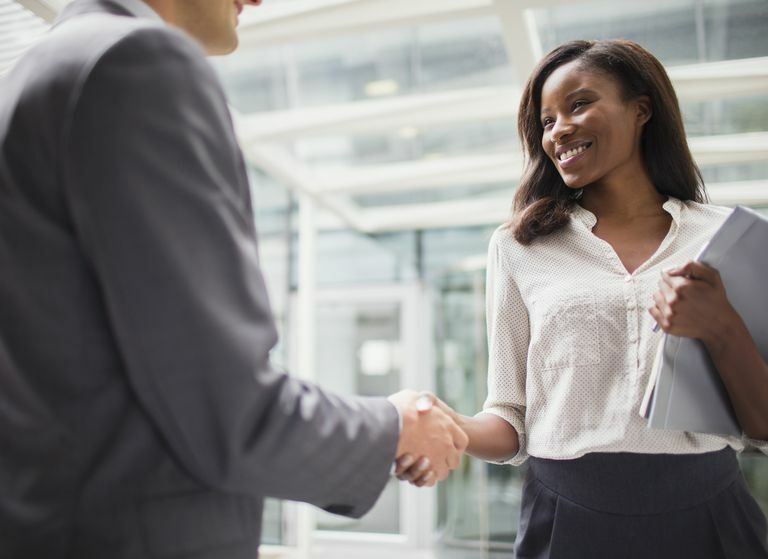 Although it is possible to overcome an initial bad first impression, it is easier to learn how to avoid some of the typical mistakes that people make when shaking hands. Below are the top ten "bad handshakes" and tips about how to correct each one. The dominant handshake involves placing your palm downward when offering your hand to someone and is a form of aggression. By placing your palm downward, you force the other person to place his or her palm up, which is a submissive position. Although the dominant handshake may be appropriate in some circumstances, in everyday situations it should be avoided. If you find yourself the recipient of a dominant handshake, there is an easy correction that you can make. Take a step to your left: this will force both of your hands to naturally straighten. Similar to the dominant handshake, the bone crusher is aggressive and involves an excessively strong grip. If you've ever been the recipient of a bone crusher, you know how uncomfortable it can be. Handshake grip should be no harder than the strength that you would use to hold a door handle. In addition, you should match your grip to the person you are shaking hands with. Older adults require a looser grip. If you are ever stuck in a bone crusher handshake, make a comment such as "Wow, strong handshake!" In most cases, the person will loosen their grip on you. Although there are instances in which a double-handed handshake is appropriate, if used with someone whom you have just met, it can seem overly personal or intimate. Unless you are a politician or a grandmother, it is probably best to reserve the double-handed handshake for close friends. Similar to the dominant handshake and the bone crusher, the "too close" handshake involves the other person coming in very close to you to shake hands, or pulling you in close as you are shaking hands. In either case, the closeness of the handshake is likely to make you feel uncomfortable. The fix? Simply take a step back. Unless the other person has you in a vice grip, you should be able to reclaim your personal space. Opposite the bone crusher is the limp fish. A limp handshake signals to the other person that you are nervous, uncertain, or uninvolved. A limp handshake can be particularly detrimental to your career. If you are unsure whether your handshake is limp, ask to practice with a few friends until you get your grip right. Even worse than the limp handshake one in which you only offer your fingers to the other person. In order to avoid this scenario, be sure that the webbed part of your hand between your pointer finger and thumb is touching the other person's hand before you tighten your grip. If you are nervous about introductions, you may end up with cold, clammy, or sweaty hands in social situations. Although it may feel like the situation is out of your control, there are steps that you can take to try and lessen the impact. Keep a paper towel in your pocket to wipe off sweaty palms (discreetly when you get a chance). Avoid carrying a cold drink in your right hand when you know that you will be meeting people. If your hands tend to be cold, warm them up with an instant heat packet in your pocket or a hot air dryer in the restroom. Have you ever shaken hands with someone who wouldn't look you in the eye? You probably wondered what they had to hide. Not making eye contact during a handshake signals to the other person that you are not being forthcoming. If your lack of eye contact is due to social anxiety, practice looking at a spot between the eyes, so that you at least give the appearance of meeting the other person's gaze. "The miss" is a handshake that somehow doesn't quite come together. Perhaps you went to shake hands but ended up shaking fingers. Maybe you clumsily shook hands and couldn't wait to pull your hand away. Whatever the problem with the handshake, know that the other person feels just as responsible for "the miss," and that it is purely accidental. You've probably experienced the long handshake. Long after the introductions are through the other person is still pumping your hand up and down. The ideal handshake lasts 2–3 seconds and does not go on longer than the verbal introduction. Any longer, and it can seem like you are just holding hands. In the end, knowing how to shake hands correctly is a skill that requires practice. Shake hands when you have the opportunity, and in time it will become as second nature as saying "thank you." When all else fails and you find yourself offering a bad handshake, what should you do? Move on. Try to distract the other person with a question or compliment. Although you can only make one first impression, there is usually lots of time to make up for a bad one. Share J. 19 Qualities of the best handshake in the world. University of Montana College of Business. Practice professional etiquette. University of California, Irvine. The best handshake.